OTTAWA - The Harper government froze spending Tuesday on the multi-billion-dollar plan to buy new jet fighters minutes after the auditor general produced a withering report accusing the Department of National Defence of keeping Parliament in the dark about spiralling problems with the F-35 purchase. The government also announced it would take away DND's ability to buy new weapons systems and hand it to Public Works — all in an effort to shield itself from the ensuing assault in the House of Commons that followed the release of the report by new Auditor General Michael Ferguson. The Defence Department faced wide-ranging scorn over its management of the a plan to buy 65 new F-35 radar-evading stealth fighters for what the military initially insisted would cost $9 billion. The cost of the purchase, which is already the largest single purchase of military hardware in Canadian history, will almost certainly be far higher than originally budgeted, Ferguson said. He added that Public Works should have done a better job of overseeing the purchase, but Ferguson was particularly scathing about DND's failure to come clean on potential problems with buying the F-35. “Briefing material did not inform senior decision makers, central agencies, and the Minister of the problems and associated risks of relying on the F-35 to replace the CF-18," Ferguson said in his report. "Nor did National Defence provide complete cost information to parliamentarians." DND pointedly rejected criticism that it did not exercise due diligence in managing the project. The auditor general's criticism does not mean the government will scrap the F-35 purchase or even consider opening up the sole-source procurement to other competitive bids. Ferguson's mandate limits his criticism to the conduct of bureaucrats, but his findings could be incendiary for the Harper government. The audit came just one week after Finance Minister Jim Flaherty announced $5.2 billion in cuts to public spending in his deficit-fighting budget. NDP Leader Thomas Mulcair said the report raised ethical questions with its "litany of poor public administration, bad decision making and lack of accountability by Conservative ministers. "But the key question to the prime minister is: how could he allow Parliament to be intentionally misled on the F-35s? Either he knew, and it's unconscionable, or he didn't know and it's incompetence. Which is it?" Prime Minister Stephen Harper said that was a misrepresentation of Ferguson's findings. "The government has not yet purchased this airplane, and has not yet signed a contract. The auditor general has identified a need for greater independence and supervision over some of the activities of the Department of National Defence. in this regard, the government will put that supervision in place before we proceed." Harper left the remaining barrage of questions from the NDP and Liberals to two of his ministers, Associate Defence Minister Julian Fantino and Public Works Minister Rona Ambrose. Both ministers stuck closely to the government's earlier talking points — the freezing of funding and the creation of a new secretariat of top bureaucrats to shepherd the jet purchase from now on. Defence Minister Peter MacKay did not respond to any queries on the auditor general's report. The Conservatives steadfastly defended the F-35 purchase during last year's election campaign that gave them a majority despite a growing body of evidence that suggested the project could never be kept on budget. The program is designed to replace the country's aging fleet of CF-18 jet fighters. 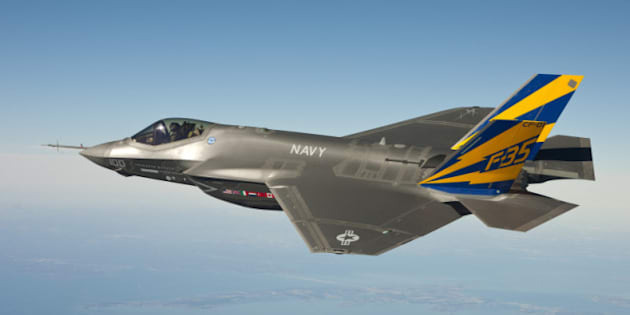 The late NDP leader Jack Layton, as well as ex-Liberal leader Michael Ignatieff, repeatedly attacked the F-35 purchase during last year's election campaign. At one campaign event, Harper affirmed his support for the F-35 purchase, and said "latitude" had been built into the government's cost estimates. "I think it's in a way sad that the new jets have become an issue in this campaign," the prime minister said during an April 8, 2011, stop in British Columbia. Ferguson's report vindicates parliamentary budget officer Kevin Page, who became embroiled in a heated public battle with the Defence Department in March 2011 when he released a report that said the cost of the F-35 could reach $30 billion over three decades. An assistant deputy minister at Defence told an elaborate briefing for journalists that Page made a "mathematical error'' in calculating the unit cost of the planes, and that his estimates on long-term maintenance were erroneous as well. Ferguson said Tuesday that Defence should have come clean with the real figures at that time. He pegged the projected 20-year cost of the program, including maintenance, at $25 billion. "As a response to what the Parliamentary Budget Office did, that's when National Defence should have brought forward that full costing," Ferguson said. Liberal defence critic John McKay accused the government Tuesday of trying to hide the true cost of the program from Canadians. "Now they appear ready to throw bureaucrats and our armed forces under yet another bus, but Canadians won't be fooled. Responsibility for this fiasco lies squarely on the prime minister's desk." The United States oversees the nine-country Joint Strike Fighter Program. The planes would be built by the U.S. defence giant Lockheed Martin, but the rollout of the plane has been plagued by delays, technical problems and a 64-per-cent cost increase. Those problems have been well-documented in reports by the U.S. Government Accountability Office, an investigative branch of Congress. Harper and his government were briefed in advance on the criticisms in the auditor general's report, allowing them to prepare their response in advance. Along with a freeze on spending above $9 billion, the government created a new oversight mechanism for the F-35 procurement — an inter-departmental secretariat of deputy ministers to oversee the project. The Tories received accolades for establishing such a secretariat to administer its recently announced $33-billion National Shipbuilding Program. The Harper government has said it expects to pay US$75 million dollars for each of the F-35s. But others — including Canada's parliamentary budget officer — have said the actual cost could be close to double that figure. The government has not signed a contract with the U.S. to buy the F-35s. But it has invested $335 million so far to meet various commitments over the 15-year history of the U.S.-led JSF initiative.